The L2 Line Layer’s carbide-edged blades slice through the ground with a reciprocating motion while simultaneously installing line. Line-Ward offers a wide variety of quality, hard-surfaced vibratory plow blades and will assist you in selecting the proper blade choice for your specific application needs, from irrigation to cable installation and more. The Ripper Blade will pre-cut a path through severe ground conditions. The Root Blade has a serrated edge for pre-cutting a path through even the worst root conditions. 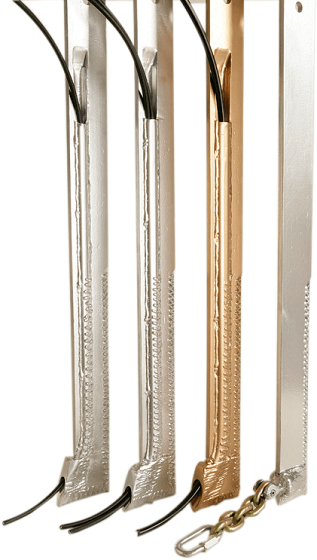 The Regular Feed cable plow blade is used for installing a RG6 coax cable, 2 or 3 pair telephone low voltage wire and underground pet containment wire. The Large Feed Blade allows installation of two of the above wires in the same pass as well as some larger wires. The Extra Large Feed cable plow blade is designed to install 6 pair and some 12 pair telephone drop wire and RG11 cable wire, as well as some fiber duct products.